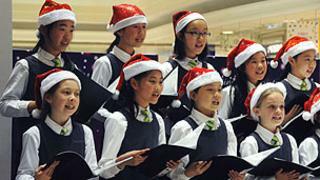 Image caption Carol singers in Shanghai this week: Are UK students ready for a globalised economy? Business leaders are warning that students in the UK are lagging behind in developing an international outlook needed for a globalised economy. A British Council survey suggests many employers are struggling to recruit staff with a "global outlook". The report says UK students need wider horizons if they are to compete with rising economies such as China. The "UK economy risks losing global competitiveness", says Jo Beall of the British Council. The Global Skills Gap report reflects concerns that UK students remain too insular in their outlook. Multi-national companies, with staff and customers in many different countries and cultures, have told the survey of the importance of recruiting employees who can "think globally". According to the survey of 500 business leaders, 75% fear that the UK economy is at risk of being "left behind" because of a lack of recruits who can have such an international awareness. In particular they warned about being overtaken by "emerging economies such as China, India and Brazil". The survey, commissioned by the British Council and Think Global charity, also found that 74% of these business representatives warned that in the UK young people's "horizons are not broad enough" for a globalised economy. Businesses which traded heavily with other countries found it particularly hard to find the right staff, with the survey finding that among such multinational firms 35% find it difficult to recruit employees. Business leaders suggested that this could be because schools were too worried about exam results and league tables to encourage pupils to learn "about the wider world beyond the school gates and beyond our shores". The report warns that if UK students do not have the skills wanted by multinational employers then "highly skilled and highly paid jobs will be increasingly taken by young people in countries other than the UK". "This risks a future for many young people in the UK consisting of low-paid jobs or being out of work," says the report. Jo Beall, British Council director of education and society, said "This research shows that while British students are extremely keen to gain international experiences, there aren't enough of the right opportunities for them to gain the professional skills that British employers really value."